The Gorkha Janmukti Morcha (GJM) has initiated talks with senior BJP leaders in Delhi for sharing of seats in the upcoming Siliguri Municipal Corporation (SMC) election. 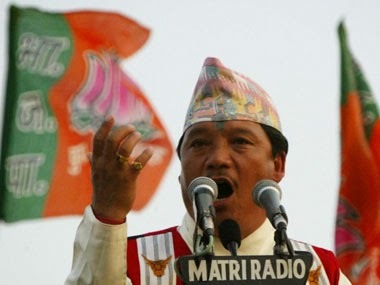 GJM president Bimal Gurung while welcoming defectors from the Trinamool Congress (TMC) and the Gorkha National Liberation Front (GNLF) at Malidhura, seven kms from Darjeeling town said, “We have a strong Nepali population in six to seven wards under the SMC and we want to exploit that. We have already started discussions with senior BJP leaders in Delhi. Let us see what happens”. The SMC election is scheduled to be held on April 25 and filing of nomination will take place from Monday. “Even though the BJP has said it would give its candidates from all the 47 wards but we are looking at sharing some seats. The possibility that we field our candidate in the BJP ticket in wards where there is a major Gorkha population while extending support in others is there. At the moment we are looking at all the options,” said Gurung on Sunday. In the 2009 and 2014 Lok Sabha election, GJM had supported the BJP snubbing the TMC. In the 2014 election, BJP candidate S.S.Ahluwalia won from three of the four constituencies of Matigara-Naxalbari, Phansidewa, Siliguri and Chopra in the plains. TMC candidate Bhaichung Bhutia had won from only the Chopra constituency. On Sunday more than 350 supporters from the Trinamool Congress and Gorkha National Liberation Front from the Sukhiapokhari and Maneybhanjyang area disillusioned by their party’s policy and lack of activity shifted allegiance to the GJM. Gurung handed the GJM flags to them. The GJM president who returned back to Darjeeling on Saturday said his Delhi visit had been successful. “We met Prime Minister Narendra Modi and apprised his about our century old demand for a separate state. We got positive response from Modiji. We will not achieve a separate state immediately but we are in the right track. However, we need to continue to work hard towards realizing our demand,” Gurung said. Gorkha Janmukti Morcha (GJM) has initiated talks with senior BJP leaders in Delhi for sharing of seats in the upcoming Siliguri Municipal Corporation (SMC) election.